The Doctor and his companions are lost in time. 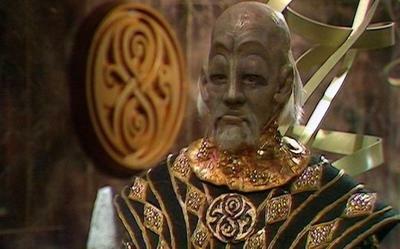 Expecting to be reunited with the TARDIS following a secret mission for the Time Lords, they instead find themselves on a plague-stricken space station orbiting the remnants of Voga, Planet of Gold. The Doctor, Harry and Sarah Jane have stumbled into the last battle of an ancient conflict between humankind and one of its most terrifying foes – the Cybermen. Tom Baker is the Doctor in Revenge of the Cybermen. Revenge of the Cybermen brings about the end of Tom Baker’s first season as the Doctor with a resounding thud. A promising first episode and one neat location can’t support a bad script that suffered from constant rewrites, giving us dodgy dialogue, an alien race we couldn’t be bothered to care about, and the Cybermen once again being utterly wasted as a potential threat. With the events of Genesis of the Daleks behind them, the Doctor, Harry and Sarah Jane find that the Time Ring has brought them back to Nerva Beacon where the TARDIS should be waiting. But the Time Bracelet has brought them back to the era before Nerva was turned into an ark for humanity, and the TARDIS is slowly working its way through time to meet up with the trio. However, instead of a bustling space station the Doctor finds a platform under quarantine. It seems that a deadly plague has ripped through the inhabitants, leaving only a handful of military personnel and one other alive – a civilian scientist who busies himself with the study of a nearby planetoid comprised almost entirely of gold. As Sarah Jane finds herself stricken by the plague, Harry and the Doctor discover that the plague isn’t being spread by airborne or physical means, but rather by the actions of a metal snake-like creature. And such a creature can only be the harbinger of a much bigger threat – an impending attack by the Cybermen! I’ve heard throughout the years that Revenge of the Cybermen was not a good story. So I popped in the DVD and sat down to watch it, and by the end of the first episode I was thinking to myself “this isn’t that bad…it just has the unfortunate position in the broadcast order of coming after Genesis of the Daleks!.” Then the second episode hit. And then the third. And then I found myself waiting over a month to hold my nose and wrap up the serial. I really want to tell myself that this story is better than I thought and that I’m just holding it up to to the higher standards of Genesis and The Ark in Space, but I would be lying. This simply isn’t a good story. And this is the kicker – all this happened after NUMEROUS rewrites by Robert Holmes, who I imagined had to have just given up at some point and collapsed on his typewriter, deeply considering taking that job on Blake’s 7. So production was a bit rushed because of last second changes to the script (blame can be assigned to both Davis and Holmes for this) and it ends up showing on-screen in all the little things regarding continuity, abrupt scene changes, and a musical score that just doesn’t quite click with the story itself, something that Philip Hinchcliffe specifically mentions in the behind-the-scenes segment. It doesn’t help that the aliens in this story are rubbish. The Vogans are the inhabitants of the asteroid of gold, Voga, and are divided into the same “pacifistic isolationists” (Tyrum, played by Kevin Stoney) and “ruthless would-be conquerors”(Vorus, played by David Collings) that seemingly make up the central conflict of every one-shot alien race that graces the annal of Doctor Who. There’s a lot of shouting, a lot of Vogans storming in and out of rooms, a lot of Vogans shooting at each other in some kind of low-level civil conflict (yes, the Cybermen are coming, let’s fight amongst ourselves), and…well, they just look silly. 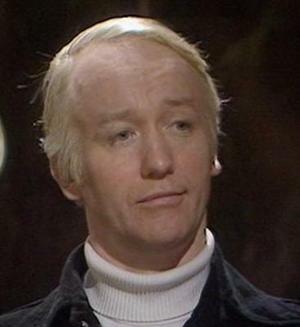 Trivia point – the masks for the Vogan extras were made from a mold of the face of Arnold Ridley, star of the BBC hit sitcom Dad’s Army. The human side of the supporting cast fairs a little better, with Ronald Leigh-Hunt making an effort as Commander Stevenson, dedicated to following orders and keeping Nerva isolated at Earth’s request, but William Marlowe’s Lester just looked like he’d rather be anywhere else then acting in this serial, managing to look bored and distracted. The saving grace is the performance of Jeremy Wilkin as Professor Kellman. From the first moment he’s on screen, he screams “ANTAGONIST AND BAD GUY” without saying a word. I mean, seriously, look at the sheer disdain and arrogance. He has this look on his face the ENTIRE serial. Either Wilkin (best known for his voice work on a variety of Gerry Anderson’s productions including Thunderbirds is one of the best damn actors ever or he was just letting his thoughts on how bad everything about the production of this story was every moment he was on screen. While they’re a far cry from the more aesthetically pleasing Cybermen of the revival, the colorization of the show has been a bit kind to the metal monsters from a visual standpoint. Too bad any really sense of menace or threat is absent from their presence. 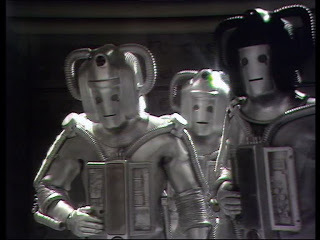 The dialogue the Cybermen have to give is appalling, beginning with the fact that they’re all portraying emotions, in varying accents, to the point where the Cyberleader stands, hands on his hips, proudly calling for the death of the Vogans in a South African accent, being as camp as all get-out. While there are some neat moments such as the Cybermen having weapon built into their heads, the rest of the time they bumble about, shouting about their lack of morality in warfare while the Doctor easily defeats their plans without breaking a sweat. Hell, even with the Cybermen are introduced it isn’t done with any clever camera angles or only a partial reveal to help build tension. Compare the shadows and low-angle shot of the Daleks in the previous story to the full exposure of the Cybermen in this one and the difference is obvious. Tom Baker’s Fourth Doctor can’t save this one, and I think Baker knows it. Towards the end of his time on the show, Baker has a reputation for disdaining scripts and had no problems let the writers know it. The first glimpses of such traits can be seen in this story as Baker simply treats the Cybermen as a non-threat. Oh, he snarls and yells at them, and throws out his own quips and barbs, but it’s never with the appropriate level of concern regarding the vengeance of a group of metal monsters. In a way, that makes Baker the best thing in this mess, acting almost as an audience surrogate with just how bored he is with the proceedings, calmly playing with a yo-yo even as a asteroid-destroying bomb is strapped to his back. Again, it’s early on in the serial that features the high point for the Doctor, as he escapes a room with an electrified floor with quick rewiring and some good old acrobatics. What IS good about this serial? Well, the setting! With the costs of shooting on location for The Sontaran Experiment and the six-parter Genesis of the Daleks, the producers decided to save money by reusing the set of Nerva Beacon from The Ark in Space. Director Michael Briant does a fantastic job making Nerva look like a space station in active use thanks to some clever Chroma Key work to add radar screens, computer displays, and some clever shots where a hand-held device portrays a scene in progress. And a shout out to all the obvious mannequins lying on the floor of Nerva, “victims”of the horrific plague. The caves of Voga were filmed in Wookey Hole Caves, a tourist attraction near Somerset consisting of limestone caves and underground pools. This portion of the story is incredibly well done, as the tourist elements of stairs and underwater lights make the caves looked lived in and a vital part of Voga society while maintaining an alien, almost mystical quality. Cygnia – True confession time: I wanted a plush Cybermat as a kid. Yes, they looked like alien sliverfish. I didn’t care. As for the story itself…oy. I remember bombs stuck on the Doctor et al. I remember really Unfortunate Implications with the way the Vogans looked. The underground caves, those were admittedly cool. But the story itself, for my first introduction to Cybermen, it was just “eh”. Accordion or not though, I kinda also wanted to dress up as a Cyberman for Halloween. That never happened, sadly enough. Revenge of the Cybermen simply isn’t very good. 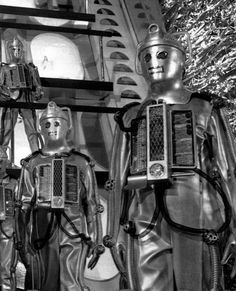 When a quietly over-the-top human accomplice and a web of caves serve as the highlights of a story featuring the return of the Cybermen after eight years, it’s a mark that something went wrong somewhere in production. It’s a shame that a season with two B+ episodes and two all-time classics ends with such wasted potential. – The Cybermats’ vicious attack hug! – Sarah Jane on a jet ski! – The climax involves the Doctor drifting Nerva Beacon over Voga (as portrayed by what looks like a rapidly spinning cheese log) to avoid a deadly impact. Yes, the Doctor drifts a freakin’ space station to save the day. – Torture by shoulder massage! 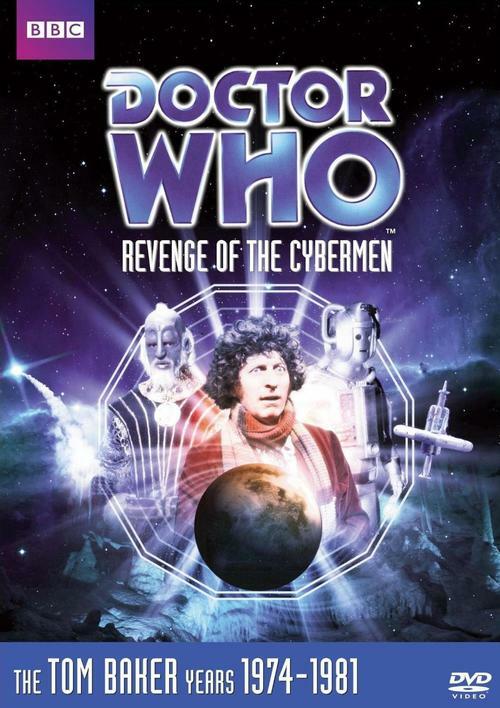 Cobi’s Synopsis – Revenge of the Cybermen wastes the return of the Doctor’s iconic foes as numerous script rewrites lead to continuity snarls, poor motivation and characterization for the Cybermen and their alien foes, and actors who very obviously don’t care. This entry was posted in Classic Doctor Who and tagged cybermen, Doctor Who, Doctor Who Review, Elisabeth Sladen, Fourth Doctor, Harry Sullivan, Ian Marter, Sarah Jane, Sarah Jane Smith, TARDIS, Tom Baker. Bookmark the permalink. Hmm…I’ll have to see if I can find it online somewhere!